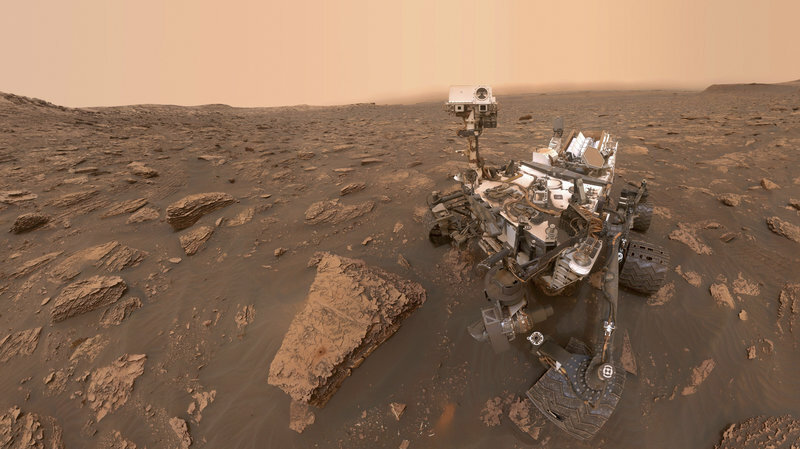 NASA’s Curiosity rover has beamed back a 360-degree panoramic view of the Martian landscape, revealing reddish-brown skies darkened by a fading global dust storm that has enshrouded the red planet for weeks. The panorama, captured from Curiosity’s current location on Vera Rubin Ridge, also includes a rare view by the Mast Camera of the rover itself, revealing a thin layer of dust on its deck. The rover surveyed its surroundings after collecting a new rock sample on August 9. Its last two drill attempts were thwarted by unexpectedly hard rocks, NASA said in a statement. The best way to discover why these rocks are so hard is to drill them into a powder for the rover’s two internal laboratories. Analysing them might reveal what’s acting as “cement” in the ridge, enabling it to stand despite wind erosion.